With socialism in eclipse and market economies gaining acceptance worldwide, a new kind of ethics is needed to address social injustice and inequity. Richard C. Bayer debunks the present direction of mainstream social ethical theory by advancing market systems themselves as a means toward promoting justice and meeting human needs. Observing that the primary vehicle for Christian ethics since the New Deal has been the welfare state, Bayer argues instead that market systems can provide a basis for reconciling capitalism and Christianity in both theory and practice. 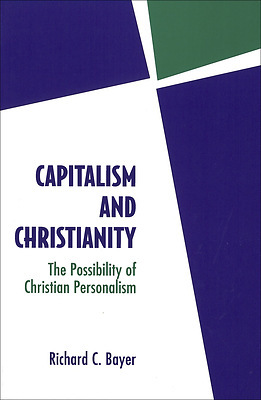 He proposes Christian personalism as an ethical approach that emphasizes the dignity of the human person and promotes the achievement of personal development through participation in a modified market economy. Bayer's work draws on Catholic social thought and orthodox economics, adopting a post-Keynesian approach that deemphasizes the role of the state in the achievement of economic justice. As an example of a personalist economic reform agenda, he describes a "share economy" that advances solidarity among workers, promises greater economic efficiency, and increases employee participation in profit-sharing and decision-making. Capitalism and Christianity integrates moral arguments with economic analysis to challenge prevailing thought in contemporary Christian social ethics. By incorporating key insights of liberalism while providing constructive criticism of that perspective, it creatively addresses both personal development and the common good.